I was only in Nepal for 3 weeks but it was an amazing experience. My placement school was Shree Krishna which is a city school of about 430 pupils from 3-18! My day started with maths for class 5, (about 16 kids aged around 8-11) very keen and addicted to stickers! Despite the language barrier they were keen to do any sum I showed them and I got them doing group work and working in teams of 4 to help each other as well. They were confused at first, as are used to just working from the textbook, but their competitive spirit converted them when the winners got more stickers! Working with a number of different classes and a number of different teachers allowed me to see a lot of the school and I was amazed how they got by with so little. I’m so used to powerpoint and worksheets, videos and calculators, that it was a massive change to stand in a room with only a whiteboard. Teaching English was harder than maths, because the textbooks they used had quite a few mistakes, and they often repeated everything without really understanding what they were saying. The students and teachers were happy to try other things but the language barrier to explain things did prove tricky, especially with the young students. All the teachers were very friendly and keen to improve their own English by chatting and really made me feel part of the staff. 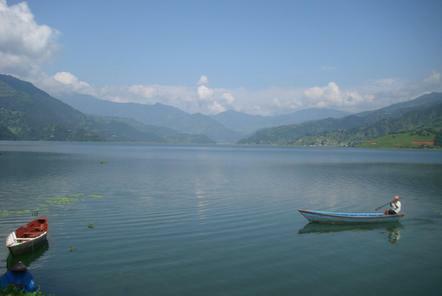 Outside of the placement I had lots of time to chill and explore in Pokhara in the evenings, weekends and random national holiday days! I went swimming, boating, kayaking and paddle boarding on the lake by hiring them from local shops. One Friday afternoon I went paragliding, which was awesome, and I got to see how big the city was and glimpse the surrounding mountains. I also went on a sightseeing tour in a taxi with another volunteer and visited Devi Falls, bat caves, a local museum and the peace pagoda overlooking the lake. 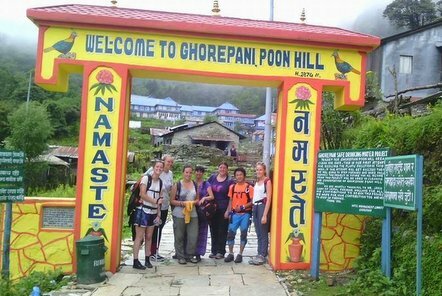 As there was a 4 day public holiday while I was there 6 of us decided to go for a 4 day trek around the Annapurna mountains area. Despite the weather (full on monsoons and clouds) the trek was excellent. We had a great tour guide who kept our spirits up (we needed it with 3800 steps up in one day!) and it felt like a real achievement to complete quite a challenging trek. I went on this volunteer holiday by myself but I was never lonely! As everyone was there for the same reasons we all got on well and gelled as an ever changing group, as volunteers came and left. We went out for evening meals together and always had stuff to talk about from our placements and activities from the day. Sarah and Chrissy (and Buttons the dog) made us feel very welcome and reassured knowing that there was someone who knew the area who could help if there were any problems. If you would like to volunteer and teach at one of our projects around the world, please visit our teaching page to find out how.